Just Teachers asked Fleek to design and develop a new website for them that would, among other aims, increase their organic positioning so they could reduce their paid advertising spend. Just Teachers also wanted the ability to manipulate and edit the website themselves, so they could be proactive in adding new content as required by the business or responding to market need quickly. Fleek marketing delivered a responsive site in WordPress, with an enhanced user-friendly content management system. The website that Fleek built has allowed us to be more agile and respond to the market more quickly. 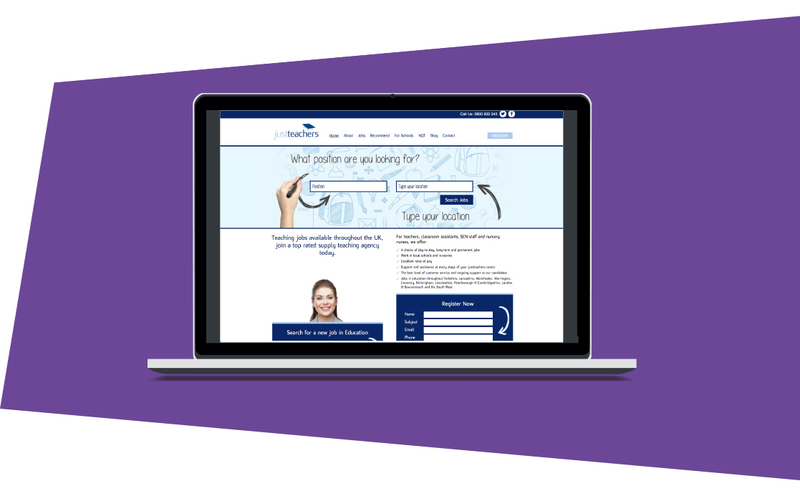 From a user perspective, the whole journey and user experience has also been completely revamped providing a much better experience for our candidates and clients, reflected in the uplift of new candidates and clients. One of the many ways that Fleek has added value is around the exploration of ideas. They allow us to talk through ideas, listen to our aims and objectives and then come back to us with their creative ideas. Fleek is now in a position to be able to understand our needs from a business perspective and so they no longer need long briefs, or instructions, because they just completely get it.